"Billy, your guys did a great job today installing my daughter Sarah's barn style shower door. Carolyn said it far exceeded her expectations. Thanks so much!" Just wanted to say thank you to Austin Evans for quickly correcting my shower door. It is beautiful and I love it. 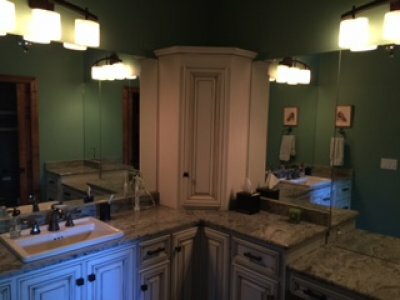 We will use Evan Glass again for our next bathroom remodel. Thank you for your help with the glass dresser top. The fit is correct and it looks great. My wife is happy and my dog and I are happy. Visit brought memories of "old school" customer service from a modern company. This is hard to find today. I enjoyed looking at the classic car. Close as I got to the car was a 1956 Ford Mainline with a "Glass pack" and a "Dynatone" muffler, LOUD. Had a lot of fun before the Highway Patrol and town constable caught me in their roadblock. I know subcontractors like yourself typically get emails or phone calls when things go bad but I like to let subcontractors know whenever I think they go above & beyond to work with me so with that said it was great meeting you for the first time and I appreciate your honesty when it comes to telling me something and it actually happens like you said and the crew you sent out here has done an awesome job. The finishes on these stores is not your normal brick so you can just throw your frame in and caulk it, these guys did a great job figuring out how they were going to make everything look like one big storefront system and today they finished 99.9% of it. There’s a couple minor things they need to finish but other than that, great crew, followed all safety policies, very professional and I would love to have these guys on my next project with you guys. Rachel and I want to thank you and your crew for another fantastic job! You all are such professionals and we would only use your company in the future. You have been great about designing the projects and your installation crews have all been top-notch. We have had many contractors, subs, service people through our house over past 3.5 years so we know how to judge quality. Evan’s Glass did 4.5 bathrooms and one master closet mirror installation over that time. Each one is a piece of art ! Just wanted to thank you again for your great help with our urgent shower repair. Thanks to you we were able to sell our house quickly and above asking price! We will gladly call on Evans for any future needs. Thanks so much for everything. About 3 and 1/2 years ago I ordered custom shower doors from your company. The hinges and handle were a rubbed bronze finish. I love the doors and everyone who sees my remodeled bathroom remarks how beautiful they are. Recently I noticed the finish coming off from the inside handle and I called Evans in Nashville. I spoke with Ted who asked me to find a number from my order so he could help with the replacement. After a thorough search of my paperwork I could not find the contract but I did find the original drawing and cancelled checks with dates. I called back to Evans and left a detailed message on what I had and then waited to be called on the solution. Well to my surprise your install man showed up the next day with a new handle and installed it in a professional manner. I want you to know that this kind of customer service is so very much appreciated in today's market. You need to be very proud of your people who made my whole experience so pleasant. You can be sure that I will always speak with praise for Evans glass whenever I have the opportunity. 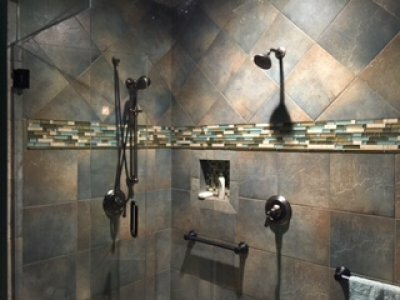 My daughter will soon be looking for a new shore door in her newly remodeled bath and I am encouraging her to give you a call. Thank you for being an upstanding quality company. 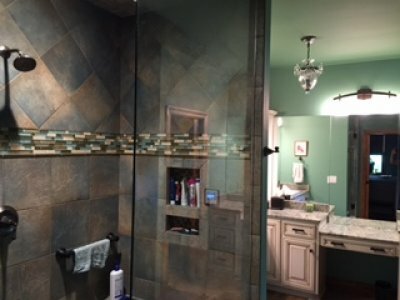 Wanted to send you a few pictures of the great work done by Evans Glass for our shower doors and mirrors! Your staff was excellent and we love the product! "Just a quick note to thank you for your excellent service. I absolutely like my patio table glass. It looks wonderful. I was unable to find the 'needed' glass at other stores. Not only did you have what I needed, you were all so friendly and helpful. You even came all the way to Springfield to measure and deliver it. I did nothing but make a phone call. I would recommend your company to anyone (and plan to). You are certainly a 'cut' above!!! It is refreshing to see such excellent customer service!!. I am most appreciative!" "Not only do I love you, but I adore you! Thank You so much! They did a beautiful job! I didn't think I wanted a pink cup but I will drink from it proudly now. We love Evans Glass! Thank you! Thank You! Thank you!"